With Birdy’s first birthday approaching I was on the quest for the perfect birthday cake. I wanted something healthy yet also tasty and with as little sugar as possible. I checked out a dozen first birthday cake recipes but none of them sparked the wish to make it. Maybe I am strange but if the cake recipe does not make me do mental “bake me, bake me, bake me” dance, I will not make it. “This sounds interesting” or “that might work” is just not good enough. In the end I decided to adapt a recipe myself and make something that is not only a healthy snack for the little one but also a tasty treat for the adult birthday guests. 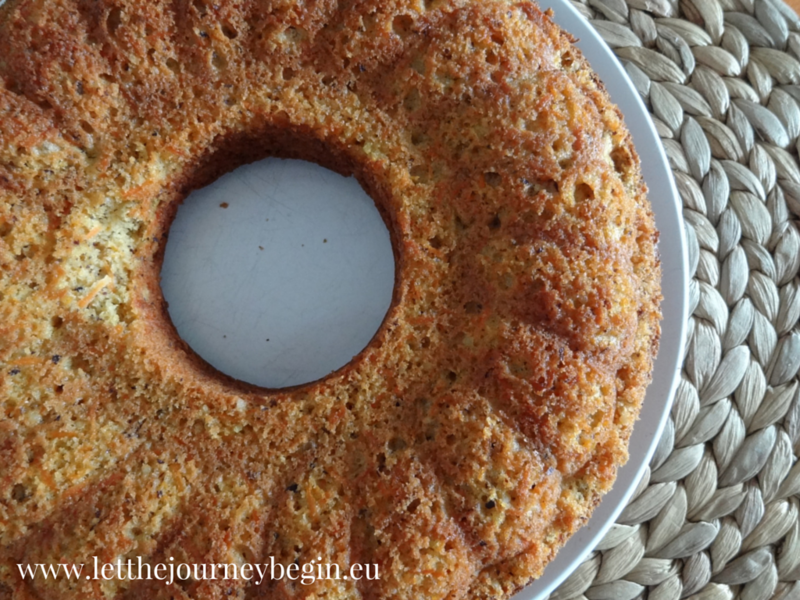 This carrot cake recipe is basically a toddler-friendly version of this German Gugelhupf recipe, I reduced the sugar amount as much as I dared without messing up the texture of the cake, left out the alcohol, and switched white flour to wholewheat. I have baked it with almonds and hazelnuts but also walnuts, and pecans should work great. The result is a moist, nutty cake that disappears from the table as soon as it is served. Separate the egg whites from yellows. Add a pinch of sea salt to the egg whites and whisk until they form stiff white peaks. In a large bowl mix the egg yellows, powdered sugar, lemon juice and peel, and the spices. Gradually add the ground nuts and the grated carrots. Finally slowly stir in the flour, baking powder and the egg whites. Fill in a buttered cake form and bake at 180 degrees Celsius for approximately 50 minutes. Let the cake cool and enjoy! The cake is wonderfully nutty and moist so I have yet to try icing on it, it just tastes soooo good also without any extras. That said, I am pretty sure that the right icing might make it even more awesome. For icing ideas check out this list from Wholesome Baby Food (scroll to the bottom of the page) or try out this mascarpone icing from Jamie Oliver. Yum!